This article was originally written by Douglas Trattner and published on Cleveland Scene on September 25, 2013. 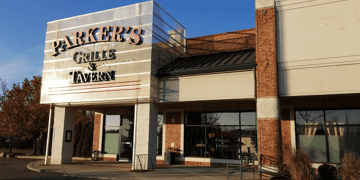 If two recent visits to Parker’s Grille & Tavern are any indication, the fourth time appears to be the charm for this revolving-door restaurant space in Avon Lake, which has been home to four eateries in seven years. On both a weekday and weekend, the large dining room was operating at peak capacity. During one of those visits, the patio was fully occupied as well. Owner James Mowbray believes that previous operators made the mistake of being too specific with their target demographic. Parker’s, he added, was designed to appeal to just about everybody. It used to be that independent restaurant owners did everything they could to distinguish themselves from the bland national chains. But recent trends show a reversal of sorts, with indie operators borrowing more than a few moves from the chain playbook. That’s the case at Parker’s, where a broad, general and, yes, boring menu aims to be all things to all people. Consider it an amped up version of the neighborhood tavern, where burgers and grilled cheese sandwiches share menu space with barbecue ribs and ribeye steaks. Appetizers run the gamut from a pair of small but good crab cakes ($11) to a foursome of Cajun-dusted lamb chops ($12), cooked perfectly and served with a side of ranch dressing. Everybody seems to be doing blue cheese-topped potato chips, and, unfortunately, most are doing it better than the version served here. Called Underground Chips ($9), the dish consists of good, thick chips drizzled with a too-sweet balsamic glaze and sprinkled with sage and crushed walnuts. The advertised blue cheese comes in the form of a cold dip on the side. A wedge salad ($5) arrives appropriately cold, crisp and cooler-fresh, but it was also light on blue cheese. Flat bread pizzas, built atop a puffy pita-like crust, make decent appetizers or entrees, with toppings like mushroom and brie ($12) or a Margherita with tomatoes and fresh mozz ($11). Burgers are big and flavorful, but our Norm burger ($12) showed up medium instead of medium-rare and the fried egg had lost its ooze. A dish called “jumbo shrimp scampi” ($17) is, in truth, a simple pasta dish with tomatoes, garlic and a few medium-size shrimp. For 10 years, Mowbray served as GM at Morton’s in downtown Cleveland. His partner Paul Kalberer was the executive chef there for four years longer than that. 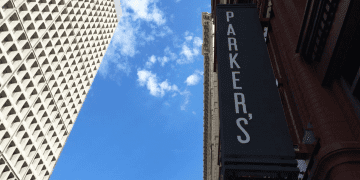 But don’t expect USDA Prime chops at Parker’s – or the inflated prices. Here, a brand called Angus Reserve (no USDA grading is listed) is offered in four cuts: filet ($25), strip ($32), ribeye ($29) and cowboy ($35). While far from steakhouse steak, the beef doesn’t taste like a letdown either. They’re nicely charred and served with the predictable asparagus-mashed potato combo. While Mowbray would be the first to admit that Parker’s is not Morton’s, he did say that he holds himself and his staff to the same level of service. That’s easier said than done in the far-off suburbs, where there isn’t exactly a surplus of professional servers. We felt ignored at times on the back patio, where an obviously overtaxed server ran around like her hair was on fire. Dining indoors on a separate night was a completely different experience, with great service, recommendations and pacing. When a steak at our table came out cold and rare instead of the requested medium-rare, it was returned properly cooked by James himself. When we needed a little help picking out a glass of wine, Victoria was quick to offer a suggestion. In the end, those are the reasons diners choose indies over chains—even when those indies look and feel a little like chains. At least here, owners are accountable, eager to please, and in it for the long haul. That’s something you’ll never find at Applebee’s. 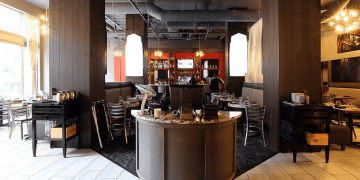 If you’re looking for a great happy hour in Cleveland, try one of the following nine recommendations from Cleveland Scene. Check out the top five steakhouses in Northeast Ohio according to WKYC’s Brian Crane. Here are seven things you need to know about the Parker’s Downtown, the sister restaurant to Parker’s Grille & Tavern.